Fireworks can play a big part in celebrations, especially for Bonfire Night, Diwali, New Year’s Eve and Chinese New Year. Having a fireworks party with family and friends can be great fun. But have you considered attending an organised event? Fireworks are explosives and burn at high temperatures, so they need careful handling and storage. Don’t put your family or friends at risk. 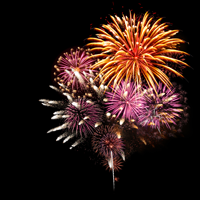 If you are holding a fireworks party follow these top tips for a safe home display. Only buy fireworks that have the CE mark - this means they are safe and conform to European safety standards. Check the fireworks you buy are suitable for the size of garden. Read the instructions in daylight. Store fireworks in a closed metal box. You will need suitable supports for Catherine Wheels and proper launchers for rockets. Use a torch to read the instructions. Never a naked flame. Light fireworks at arm’s length, using the taper provided. Store fireworks in a closed metal box and take them out one at a time. Don’t throw fireworks or put them in your pocket. Never go back to a lit firework. Even if it hasn’t gone off it could still explode. Don’t drink alcohol if setting off fireworks. Nominate a responsible person who’s not drinking to take charge of the firework display. Never give sparklers to a child under 5. If your neighbours have pets let them know you are planning on setting off fireworks. A simple sparkler reaches a temperature of up to 2000ºc. That’s 20 times the boiling point of water. A typical rocket can reach up to 150 miles an hour. Half of all firework accidents happen to children under the age of 16. Three sparklers burning together generate the same heat as a blow-torch. If you would like information on firework licences please visit fireworks licences on the Oxfordshire County Council website. On the 5th November when they can be used up to midnight. On New Year’s Eve, Chinese New Year and Diwali when they can be used up to 1am the following day. Need to dispose of unused fireworks? Oxfordshire Trading Standards operate a disposal service for unwanted fireworks . If you would like to dispose of fireworks please contact a Trading Standards Explosives Officer to arrange.